Leading By Example: IF WE ARE EXPECTED TO COMPLY WITH ORDINANCES, WHY HAVEN’T SOME OF OUR CITY OFFICIALS ALREADY DONE SO? In the last blog I started a new section with the heading of Homo Hypocriticus. For many years, I have noticed that humans (Homo sapiens), myself included, have a tendency to be hypocrites to one degree or another. So the intention of the new section is to point out examples of what myself or others consider hypocritical and usually unjust behavior by government or others. My Street in Baker City, Oregon. We don’t have sidewalks and we are fine with that. Let me say out front that short of real, as opposed to imagined, safety issues and crime problems, including dogs running loose, I generally don’t care what people do with their property. I don’t care if your sidewalk is crumbling or whether you have one or not. I don’t want one and can’t afford one. I moved to the area on the west side of the tracks because it provided opportunities, as well as room, for animals, firewood processing, vehicles, gardens, etc. My house is old and I’m not in to trimming hedges, but the roof is new and the place is fine for me. I could see the condition of properties in my neighborhood and decided I could live with that and, in fact, that it fit in with the way I wanted to live. What other people consider visual nuisances just doesn’t offend me that much. Too me, the way we live in much of Baker City is related to the rural experience that our City is suppose to cherish. If someone is obsessive/compulsive about order and tidiness, then they need to go somewhere else, like north Elm Street, the subdivisions around the golf course, or Portland. In the past, the policy on ordinance enforcement was to respond to complaints only. For example, the council minutes for Sept. 26, 2006 say “The Police Department normally enforces the [abandoned vehicles] ordinance only in response to complaints from members of the public.” Then in May or June, allegedly due to police overtime issues related to training time, the City decided to hire a new police officer and part-time evidence room clerk. Turns out that the new officer and clerk will enable the community service officer to “look for violations as well” on a full time basis (Herald/Jacoby/8-2-07). The problem I have with this approach is the abruptness of the change from little or no enforcement to what may be “aggressive” enforcement in such an abrupt manner and without any period of public input and discussion. The Herald followed up with an editorial on August 8th reminding us that we have “blemishes,” and applauding the fact that “Brocato intends to change that.” (Given the light punishment meted out by the City to an actual criminal City employee, I guess the Herald was happy to see him go after somebody.) They decry a situation where residents might have to live next to people who have “water that harbors disease-spreading mosquitoes.” Uh huh. I’ve been waiting for over a year for the Herald to suggest a change in county irrigating practices to lessen our exposure to the dangers of mosquitoes spreading deadly West Nile virus, most of whom come from irrigated fields and sloughs, and not the tires and bird baths in your back yards, but City residents who are subject to the winged onslaught don’t seem to be able to match the political power of ranchers and farmers. Instead of seeing a change in irrigation practices, residents just get to help pay for combating the disease bearing mosquitoes the ranchers and farmers help create. A human life or two now and again isn’t too much to pay to maintain the status quo for agriculture. Besides, we have bigger problems to fight, like that inoperable vehicle in your back yard or your buckled sidewalk. Finally, on August 13, the day prior to the last City Council meeting, the Herald ran an article entitled “City’s next step: the sidewalks” describing how the City has decided to start enforcing the old sidewalk ordinance which requires homeowners adjacent to dilapidated sidewalks to fix them. A City employee is said to have brought the attention of the City staff to a badly buckled sidewalk on Balm Street. In our "Tree City," many sidewalks become lifted and damaged by tree roots. Some thought that we had gotten used to it. What a convenient coincidence that a City employee brought a bad sidewalk to the attention of the City just when City Attorney Fine was preparing to present his new sidewalk ordinance! Given that there are many instances of buckled and dilapidated sidewalks in town, given the ominous title to the article of “City’s next step,” (Yikes, what is this Council going to do to us next? ), and given my knowledge of other inconsistent enforcement, I decided to go to last Tuesday night's Council meeting. Checking to see if he had washed behind his ears. I told them I had concerns that their recent ordinance enforcement endeavors (crackdown) had the potential to become a class war on the poor as many people in town, who may be in violation, are low-income residents and may lack the resources to respond to the City’s demands. I mean, what with all the publicity and the full-time enforcement officer, they are only going to encourage the Nuisance Nazis, often the well off, to proceed with their vendettas against people who live differently than themselves. It will be like it always has. People make a choice to move to a place where things are not as they like and then they unleash their barrage of complaints. They didn’t have to move in next to a poor person, but they did, and now they want the city to do something about their newly acquired nuisance neighbor. They didn’t have to move into “the dirtiest town,” but they did, and now they are going to help us become decent, civilized human beings by making us live like them. They don’t know that one person’s nuisance is another person’s treasure. They have never been poor, or they don't remember, and they don’t have the experience or imagination to develop the necessary empathy. They are a threat to the poor and others who want to live and let live. I told the City Council that the Herald’s “next step” headline suggested that there is a plan broader than that which has thus far been discussed publicly and that the citizens of Baker City had a right to know what it is and to have input (early input I would think). Ultimately, it came out that City Attorney David Fine has plans to submit over 12 “modernized” or new ordinances to the City Council in the coming months, so hang onto your hat. Finally I asked the City Council to take responsibility for what is happening to us. Many of us had thought that the new City Council would be different, but it now looks like the kinder, gentler new boss, is the same as the old boss, except perhaps worse. Perhaps we need to shorten the terms of Councilors to two years so that we can limit the damage done if they go off on an authoritarian tangent. Speaking of responsibility, I noted that transferring Council’s traditional responsibility to staff, as happened later in the meeting, had the effect of actually diffusing responsibility and making no one accountable to the public. Later during discussion of the public contracting rules, Councilor Calder worried that the transfer of the Council’s traditional responsibility to staff would leave them with little to do at meetings and could lead to less transparency in local government. I agree. Finally, discussion turned to the Balm Street sidewalk issue and the new sidewalk ordinance. One important fact that came to light is that no one could recall the last time they received a complaint about sidewalks. That might have put a damper on all the hoopla about a sidewalk problem, but thankfully the City employee came forward with a complaint to get the ball rolling. The individual who was being required to fix their sidewalk by the City stated that she felt she was being “made an example of” and “singled out” because the whole street has many areas of dilapidated sidewalks. It seemed like Sam Bass agreed as he noted there were numerous instances of dilapidated sidewalks in town. He said there is a 4-inch drop in the sidewalk right next to the subject property. Further down in this blog will be examples of instances where City officials themselves could have been the example used for broken sidewalks but it might have been too messy to point out their deficiencies. Better pick on people in the low-income section of town. The whole situation is perfect for the powerful to abuse, through selective prosecution, those they dislike or disagree with. Councilor Bryan noted that Boise has a fund which provides up to 25% of the cost for repairing broken-down sidewalks and he was amenable to discussing alternatives, including Baker City allowing residents to remove crumbling sidewalks if they wished. Given that Attorney Fine and others, including myself, see sidewalks, where they exist, as a public asset, perhaps we could agree to have the city help fund all or part of sidewalk repair and maintenance. Interestingly, given the condition of sidewalks at one of his properties, Steve Brocato said that “if somebody trips . . . we got an issue” and that the new ordinance would “give us … authority to proceed on this before somebody gets hurt.” The Herald reported that he said it is the City's responsibility to make sure dangerous sidewalks get fixed if they are aware of them (paraphrasing Herald/Jacoby/8-15-07). Councilor Schumacher said that there are more places without sidewalks than with sidewalks. He thought that the “way our whole city looks as far as sidewalks” is “atrocious.” He didn’t think that it was fair that some had to fix sidewalks and others don’t have to put one in. “We have a city-wide problem and we need to say we need sidewalks on all developed streets in the City limits of Baker. I think it is unfair to make someone maintain a sidewalk that they put the expense to put in without saying look, you don’t have a sidewalk, he needs to get one put in. I think that you gotta be fair both ways and there are a lot of places that we should have sidewalks in this town and it’s not right that people go down a sidewalk and then have to walk out in the middle of the street because there is no sidewalk.” Hear that Commissioner Warner? (Commissioner Warner has a curb but no sidewalk.) Please note that Mr. Schumacher’s plan would not require him to install sidewalks at his property on Carter Street or at his property on Vista Heights Drive. He already has one, such as it is, at Crown Courtyard. Well, I’m not a “civic leader,” but I decided to take the advice of the crusading new resident who just retired here and “just look around” a bit to see how bad our nuisance and sidewalk situation has become. Before starting my survey, I went to the Assessor’s property search page at http://www.bakercounty.org/Assessor/Assessor_Search.html and looked up some of the property addresses of those on the Council and a few of the City staff. I was really surprised at what I saw when I visited some of their properties. I didn’t visit Gail Duman’s house because she is in a new development with new curbs and sidewalks, and she doesn’t have other properties here except her store on Main, where the sidewalks are kept up. Neither did I look for Sam Bass because I couldn’t be sure where he lived given the records available and I simply don’t have time to locate his home. I think he lives over on my side of town and probably doesn’t have sidewalks but I don’t have a lot to base that guess on. Note that the street is gravel and that there are no sidewalks or curbs, so I guess Mr. Schumacher doesn’t think they are that important. I counted 12 or so vehicles in various stages of repair in addition to assorted trailers, boats and the like. Any nuisance violations here? As owner of the house, Mr. Schumacher is ultimately responsible for the condition of the property. Where has he been? Contrast this house with a home (just below) he owns on Vista Heights Drive. 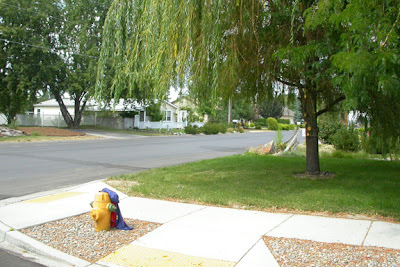 This picture above is of the rough curb cut (and edges to trip on around fire hydrant) on the corner adjacent to Mr. Schumacher’s “Crown Courtyard" bed and breakfast. Is this curb cut convenient for wheel chairs? Could you trip on the walk or edges around the hydrant? Another home I visited was a rental owned by City Manager Steve Brocato at 1805 3rd. Street. The displacement measured 6 inches from the bottom of one section to the top of the other or 4 inches from top to top. This is comparable to the buckled sidewalk on Balm Street that the city decided needed to be repaired. There are other problems with this sidewalk as well (pictures on request). Another area of buckled sidewalks is in one of my favorite blocks: the 1700 block of 4th Street. The trees cause the problem but thats how big, beautiful old trees get along with sidewalks. A city employee passed right by when I was taking the photos but didn’t stop to investigate. With these problems so close to City Hall, you have to wonder why they reported the problem on Balm Street. Another problem might be the vacant house and deteriorating sidewalk owned by Councilor Dennis Dorrah on the S.W. corner of 3rd and Campbell. According to the neighbor, this home has been vacant for over 8 years. Note dead lawn and junk on the porch. Another Dorrah’s property at 1116 Resort is well taken care of and has a curb but no sidewalk. Is there a sidewalk in Mr. Dorrah’s future? His property on 13th is also well taken care of and has a gravel street with no curb or sidewalk. Sidewalk Problems at Dorrah House on 3rd St.
Below is the well kept home of Commissioner Warner. Note the curb, but no sidewalk. If Councilor Shumacher has his way, there will be a sidewalk in Commissioner Warner’s future as well. Both Baker Garage and Gentry Ford routinely block all or a portion of the sidewalk and parkway at their businesses (Below). Why is this allowed if it is a violation of City ordinance? The sidewalk below is adjacent to a rental that the Assessor’s office says is owned by District Attorney Matt Shirtcliff at 2845 2nd Street. Some Businesses also don’t do such a great job maintaining their sidewalks. The picture below is behind the Geiser Grand Hotel on Resort Street. There are other examples nearby. Oh, and is a dumptster and garbage on the public sidewalk LESS offensive that an inoperable vehicle tucked away on someone’s private property? Mayor Petry, a broker and developer, owns the single family hotel at the end of the long drive in the picture below. No curbs or sidewalks for him to worry about as far as I can see. Below is the crumbling but serviceable sidewalk at a home owned by Andrew Bryan at 2250 4th Street. Although he voted to accept the first reading of the new sidewalk ordinance, at least Mr. Bryan seems comfortable with addressing the problem through various avenues and rethinking policy rather than simply strict enforcement. And finally, below are pictures of an old unoccupied church/rehab facility at 1620 Valley Street which is owned by Beverly Calder. The two lower front windows are broken, with the glass exposed, and there is an open window on the left side where the plywood is not secured in a way to prevent entry. Is this building an attractive nuisance and do you find its state of disrepair pleasing? I noted a lot of children in the neighborhood, including next door and across the street. I personally don't have a problem with most of the situations described above. What is troubling is to see the City begin enforcement proceedings with one of the ordinances they have announced they intend to enforce at the same time that they themselves don't seem to be taking various ordinances seriously enough to apply them to their own situations or to businesses that appear to violate them. The problem of inconsistency also rears its ugly head in other areas of enforcement. For example, the city received a complaint from someone in the vicinity of the new development on Elm Street that a weeping willow on Grove Street was blocking vision to the north as vehicles approached an intersection from the east. The willow didn’t extend into the street mind you, it just blocked vision up the street as one approached and people would have to slow down, as at any blind intersection. On the basis of this one person’s complaint, he landowner was sent a threatening letter by the City telling the owner to cut the branches so that people could see up the street as they approached. Placing a stop sign at the intersection apparently didn't occur to the City. The cutting was done, and the second time required more or less ruining the aesthetics of the tree. See picture below. Compare this situation with the visibility on 1st Street in the downtown historic district where the City has allowed diagonal parking to be instituted. (Below) The vehicles extend far into the street and there is more traffic here than up on Grove. Which is worse? To cross 1st Street you have to very carefull edge the nose of the vehicle out into the center of the street all the while hoping that no one is coming down that lane above 15 or so MPH. Why does the City encourage a dangerous obstruction of vision downtown while requiring a residential landowner to alleviate a much less serious situation by mangling a tree that doesn't extend out into the street? As I wrote previously, I don’t have a problem with the way different groups of people choose to live, but after finishing the tour of properties, the big question in my mind is why is the City coming after us if they haven’t even addressed the problems in their own back yards? Why go out to Balm Street when you could just use the City Manager’s rental as an example? Why criminalize the lifestyles of the poor and low income people? People look for consistency in the application of the law and they deserve equal protection. Lets get that right before we go off persecuting people in what often seems to be an arbitrary and class-based manner. A lot of people come this area to be close to the Elkhorns and the Eagle Caps, myself included. Little did I know that while you could get to a lake around 7,000 feet with little effort in the Elkhorns, getting there in the Eagle Caps was a whole different matter. Many of the hikes to alpine and sub-alpine lakes in the latter range requires not just that you be in shape (or have a horse), but that you spend a day or three or more backpacking in the wilderness. Well, I can't tell you how gratified I was to discover two weeks ago that you can hike to one of those beautiful lakes in a few hours and return to your camp or car on the same day. 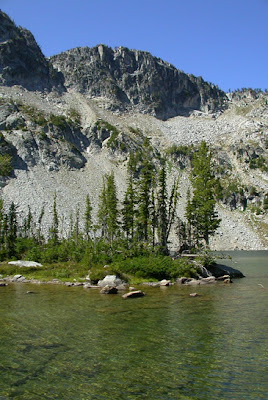 That lake is Maxwell Lake, which sits almost 2500 feet above the trailhead on the Lostine River in Wallowa County. You can reach the trailhead or the Shady Campground by traveling the Lostine River Road south from the town of Lostine for about 16 miles. The trailhead is on the left and the campground is by the river on the right. 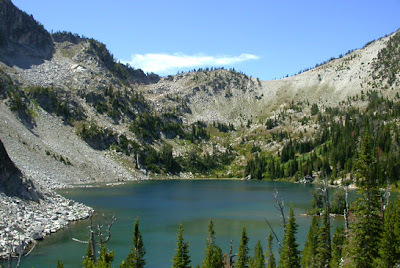 The lake is approximately 3.8 miles from the trailhead. The trail is moderate initially because you are going up a steep slope along a series of switchbacks. About two thirds or three fourths of the way up the mountain the trail becomes rougher, deeper, and unfortunately, quite a bit steeper. I took my time and took short breaks or stopped to photograph things at fairly regular intervals, but still did it in 3.5 hours. Experienced hikers who are in good shape could probably do it in 2.5 to 3 hours with no problem. When you arrive at the lake you will be at about 7,750 feet. 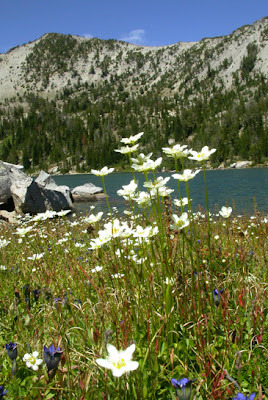 My hike was on August 7, but I would recommend mid-July or so for more wildflowers. June if you want the early bloomers. Along the way, the trail alternates between dense forest and open meadows, all on steep slopes, with one stream at the beginning and a few streamlets thereafter. I saw some of the late blooming flowers, deer, Clark’s nutcrackers, chipping sparrows, juncos, other unidentified birds, chipmunks and ground squirrels--not much out of the ordinary really. It was extremely dry so there was no shortage of dust along the way, but the lake was beautiful. I must finish this blog soon so I will quickly show you just a few of the things I saw. The asters have had their names changed recently, so if you have to know the most recent scientific name, you can look it up ( http://plants.usda.gov/ ). Ok, Ok, I'll give both names. 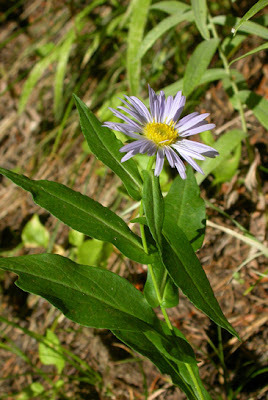 At the lower elevations especially (around 6500 to 7000 feet) you can find a common aster called Aster foliaceus var. foliaceus (Symphotrichium foliaceum) that is not hairy or glandular, has pink ray flowers, leafy-like involucres, and clasping leaves. 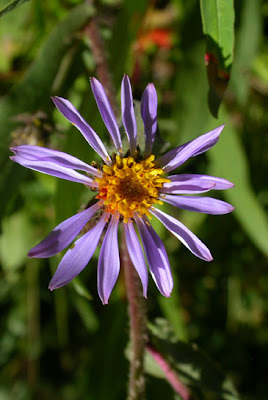 Usually at higher elevations you will encounter Aster integrifolius (Eurbia integrifolia). It differs from the former primarily by having some glandular stems and peduncles with a purplish pink flower. It is usually not as tall either. Up over 7,o00 feet you will find Hypericum formosun var. nortoniae, or western St. John's wort. 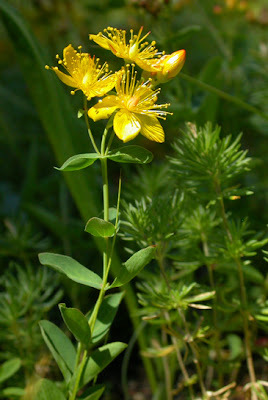 A European species of St. John's wort is used to treat depression. 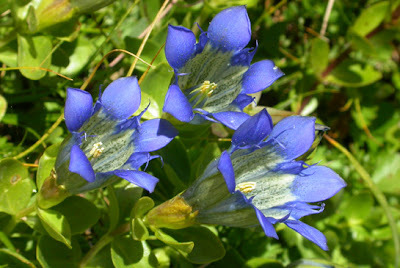 Also at around this elevation you begin to encounter a sure sign of the coming end to summer, Gentiana calycosa, or explorer's gentian. It will be with you all the way to the lake's shore. 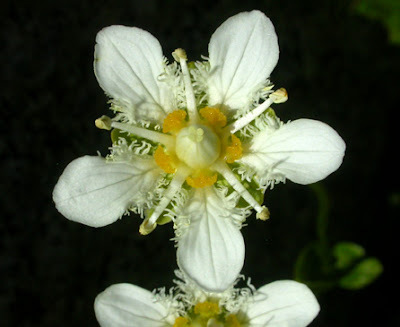 Lastly, among the other flowers you will find, such as Wallowa Indian paintbrush, is a very special member of the Saxifrage family called Parnassia fimbriata, or fringed grass of parnassus. When ever you are able to do this hike, early spring, late fall and winter excepted, and even though it can be physically draining, I am sure that you will not regret or forget it. Be sure to wear boots and appropriate clothing, take some food and water, and stop often to smell the wild flowers and take in the views. Hello from a former baker-ite! I grew up in Baker City but have since moved away. I miss Baker and like to keep up on the events of Baker. I like your blog, perhaps you can also post some of the good, fun and exciting things that are happening there. Just a suggestion from one of your readers!